I liked this one. It wasn't the best pop-tart I've ever had, but I think it delivers on what it's trying to do. The maple-filled idea seems like such a no-brainer, I'm surprised Kellogg's didn't come out with this years ago. Does it taste like French Toast? If I were to have eaten them in a blind taste test, I probably would have said they remind me a little of French Toast. What I appreciated most about this pastry was the cinnamon-sugar topping. So many of Kellogg's Pop-Tarts taste eerily similar because the flavors are obscured by the frosting they share in common. The topping on this one seems to bring out the flavor of the filling. Maple has been a tricky flavor as far as recent products go. McDonald's schlepped it up with their McGriddles. The Kellogg's Company has had better luck. They did well with their Maple & Brown Sugar Frosted Mini-Wheats and they've done a nice job here. Price reflects a 14.7-ounce box containing 8 pastries. What do you think of French Toast Pop-Tarts? Part of my childhood, miss these things. 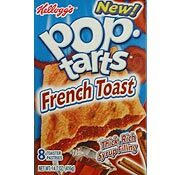 I never was a big fan of Pop Tarts until the French toast flavor came out. Sure wish they would bring them back! They are okay. But, I myself, I'm addicted to the Blueberry Pop-Tarts. I eat them day or night. I just can not get enough. I luv strawberry pop tarts day are so good day are like a lil piece of heaven with ever bite umm... im thinkin bout dem right now. Where can I find them? At what stores in Hermantown Minn? I want theses back, I loved them. I can't find them anywhere in TX. Bring them back, please!!!! This pop tart was awesome and sold out alot here in kansas please bring them back. Well, these are pretty good but I prefer C.C.C.D. Pop-Tarts. Best poptart ever. Like the cinnamon-sugar topping & the maple filling combo. But where are they? I really miss them! Please come back!! Stunningly excellent! I was actually mocking this product as it began it's way out of the silver package and slowly inched toward my mouth. But then the pop-tart was like "I TASTES GOOD, NO?" I must say these Freedom Toast (lol) I mean French Toast Pop-Tarts are among the best pop-tarts ever. Though unfrosted blueberry is still tough to beat! Well these are pretty good but I prefer the bacon egg and cheese poptarts. I agree.... best pop tarts EVER!!!! Totally addicted and can't find them either. I called and emailed Kelloggs..... their suggestion....... 'try Target or Walmart'. NO!!!!!! REALLY?!?!?? I hadn't thought of that! OMG I TOTALLY AGREE WITH BILLY! THIS IS THE BEST KIND OF POP TART I HAVE EVER TASTED! I HAVE BEEN CRAVING FOR THESE FOR SO LONG! I CAN'T HAPPEN TO FIND THEM ANYWHERE! ARE THEY DISCONTINUED?? By far the best pop tart EVER!!!! I'm totally addicted to these. My only problem is finding them! Any suggestions? Have they been discontinued? If so, I'll need therapy.